low calorie indian salad recipes. Salads need not be boring always. It is actually the art of combining the right ingredients like veggies with fruits and toss them in a perfectly flavoured dressing. The recipe so made is then a perfect healthy accompaniment to your main course or it can even serve as a healthy snack in-between meals. Add this Tangy Italian Salad to your meals and get its taste right from Italy. Loaded with antioxidant lycopene which comes from tangy tomatoes. Give a treat of coloruful leafy vegetables to yourself with this Garlicky Cabbage and Spinach Salad and as the name suggests it has loads of garlic which is also good for heart, weightloss and high blood pressure. A bundle of health - ‘sprouts’ also find place in this section. Mixed Sprouts Salad is one unusual salad in which mixed sprouts combine with tomatoes, radish, fenugreek and coriander to provide a boost of antioxidants and nutrients. Bean Sprouts and Capsicum Salad, and Sprouts and Veggie Salad have been shared in this section to get in extra fiber which aids in weight loss. Raita’s are Indian salads that are made using curds. Here in our low calorie section they are made using low calorie vegetables and low-fat curds which are responsible for its low calorie content. Have this amazing pink coloured raita called Carrot and Beetroot Raita with a good amount of vitamin A in it. Try this calcium laden Mixed Veggie Raita which has the goodness of a variety of vegetables like beetroot, cucumber and tomatoes. This innovative and unique recipe for Jamun Raita is sure to tickle your taste buds. Jamun has many health promoting properties and it is great for diabetics because of its enzyme Jamboline which helps to control the blood sugar levels. 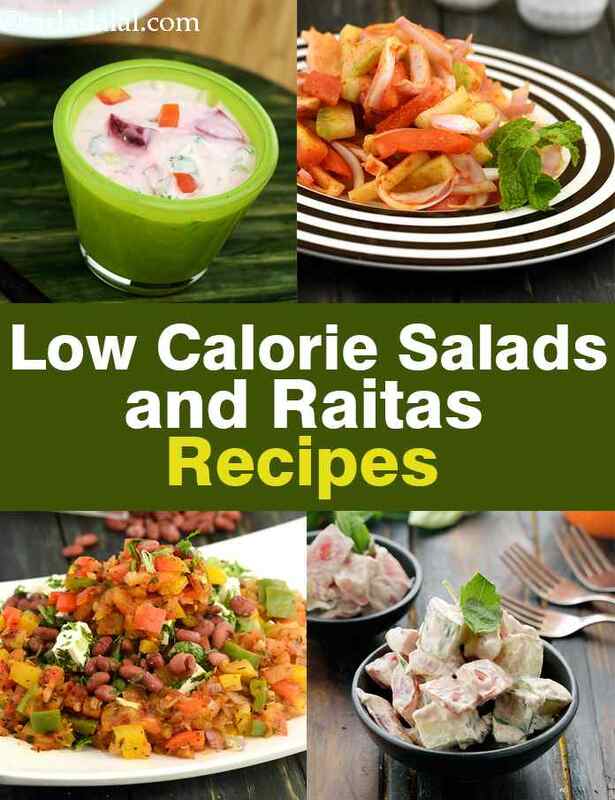 Try all our low calorie indian salads and raitas recipes. Remember to enjoy them with your choice of rotis, parathas, pulaos or biryanis.